21st February, 2013. Mumbai. Google this. Facebook that. These are just a few of the several Internet brands which have become ubiquitous verbs. And, as the increasing number of new entries into the Most Trusted Internet Brands list shows, India is contributing much to this changing grammar for sure. One significant change is that the number of brands represented in the Internet category this year has gone up from just 14 in 2012 to 25 this year showing a direct increase in the trust internet based exchanges have begun to garner. The Brand Trust Report, India Study – 2013, is the third in its series researched and published by Trust Research Advisory. This year’s research was conducted in 16 cities generating 19000 unique brands across 211 categories. Trust Research Advisory is a part of the Comniscient Group, a group of India’s largest non-advertising based communication businesses. Google remains India’s Most Trusted for the third year in a row, but it is noteworthy that the gap with the 2nd ranked Facebook is a miniscule 3%. An analysis of the All India Most Trusted ranks shows that Google (All India rank 44) fell 13 ranks and Facebook (All India rank 48) gained 17 ranks to bridge the gap. Yahoo still stood as the 3rd Most Trusted Internet brand despite its 62 rank fall in All India Brand Trust rank. Google’s Orkut, steadied at 4th rank despite a significant fall in daily visitors from India. Ebay follows as India’s 5th Most Trusted Internet brand with a very small difference in BTI from the previous. The top six of last year are repeated in the same order this year as well. 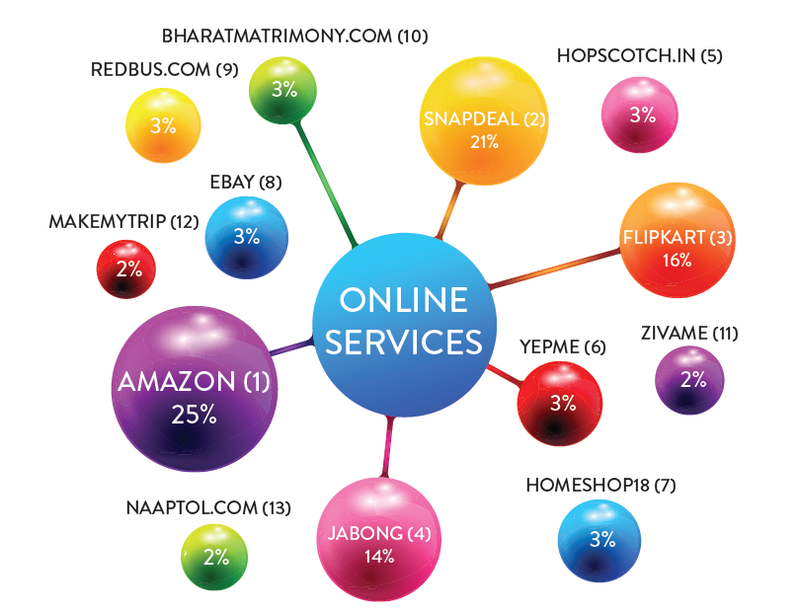 The leaders in the various sub-categories are Naukri leading in Internet Services, Youtube in Online Sharing, Ebay in Online Shopping, Google in Internet Tools and Facebook in Social Networking. A study of the number of brands in each sub-categories shows that Internet Tools is represented by nine brands, Online Shopping by eight brands, Social Networking by four brands and Online sharing and Online Services by two brands each. Trust Research Advisory (TRA), a part of the Comniscient Group, is a company dedicated to understanding and simplifying concepts related to Trust. TRA was conceived in 2008 to decipher, analyze and measure Brand Trust, to make it universally understood and easily applied. The organization’s focus areas include Research, Publishing, Trust Training, and Licensing. Committed to create metrics for efficient resource allocation for brands spends, TRA owns the global copyrights for the Brand Trust matrix. TRA launches The Brand Trust Report in the beginning of every year and the current issue is the third in the series. Kolkata, India. 1st February, 2013. The results of the most anticipated brand study, The Brand Trust Report, India Study – 2013 are out and India has chosen its Most Trusted Brands. Nokia and Samsung, India’s two most trusted brands, retain the positions East India as well. East Zone’s 3rd Most Trusted brand this year is Tata which has regained many trust ranks from its 8th rank in East last year. Sony has slipped two ranks from last year to become East Zone’s 4th Most Trusted brand, and Bajaj moves up from last year to enter the top ten at 5th position. LIC garners extra trust in the East and is the 6th Most Trusted brand gaining 17 ranks from its All India position. BMW makes an entry at 7th rank and Reliance is at 8th rank in the East. With Audi entering as the 9th Most Trusted brand, East India’s penchant for luxury cars becomes more visible. Godrej also makes an entry in the city’s ten Most Trusted at 10th rank. Studying India’s 500 Most Trusted Brands’ movement in the East Zone shows that it has extremely different preferences as compared to rest-of-India. Out of India’s Most Trusted 500, 141 do not make it to the East list. The brands which have over-performed the most in the East as compared to their All India ranks throw up some surprises, and are Nestle Munch (up 88 ranks), Bingo (up 84 ranks), John Player (up 83 ranks) and Kent (up 83 ranks). On the other hand, the brands that take the worst trust beating in the East as compared to All India ranks are the luxury motorbike manufacturer, Ducati (down 1059 ranks), Wildstone (down 955 ranks), Everest Masala (down 935 ranks) and Revital (down 923 ranks). Some East anomalies among category leaders are as follows – Quicksilver leads the Branded Fashion Category as compared to Fastrack in All India, Bharat Petroleum leads in Energy Category in East as compared to ONGC being the national leader, Maggi leads in the East F&B Category whereas Amul is the Most Trusted F&B brand nationally. Usha Fans is the Electricals Category leader of the East, a position occupied by Havells nationally and Domex is the Eastern leader among Household products, a position occupied by AllOut nationally for the third year in a row. Among Personal Accessories, East is led by Titan while nationally the Most Trusted brand in this category is Nike. In Technology, Apple leads the national Most Trusted brands whereas the Eastern leader is Dell. Surprisingly, though Tata Steel leads nationally among Heavy Industries, it does not find a ranking in the East. In the All India ranks, the category leaders are as follows. After being ranked second two years in a row, Coca-Cola makes it as India’s Most Trusted Aerated Soft Drinks brand, albeit with only a 2% lead over the 2nd ranked Pepsi. However, this is reversed in the East where Pepsi is the Most Trusted followed by Coca-Cola. Nano rides in as India’s Most Trusted four-wheeler car brand whereas it is second to Honda City in the East. In national ranks in Fabric-care, Tide beats Surf Excel while Nirma surges ahead of Hindustan Unilever as the latter slips significantly. HCC is India’s Most Trusted Infrastructure brand, DLF leads in Real Estate and, in education, IIT is more trusted than Oxford University and IIM. In F&B, Parle-G leads in biscuits and Cadbury’s DairyMilk is the Most Trusted Chocolate Bar among seven brands listed. World Health Organization leads in trust among Global Bodies followed by YMCA, UNICEF and Red Cross. Dabur, the Ayurveda leader, also leads the Healthcare Super Category of 36 brands. The mosquito repellent, AllOut, has been a leader three consecutive years and has noticeable lead of 120% over the next ranked, GoodKnight. The category of Internet has 25 brands this year and though Google leads Facebook this year also, it is only by a miniscule 3% margin. Anna Hazare is the Most Trusted Personality in India, at 87th rank this year. Being Human, Salman Khan’s Foundation, however, maintains its rank as the Most Trusted NGO in India. Most brands in the Technology Category have gained trust ranks this year with Apple being listed as the Most Trusted Technology brand. Indigo Airlines is this year’s Most Trusted Airline as Air India slips to second position. Chennai, India. 31th January, 2013. The results of the most anticipated brand study, The Brand Trust Report, India Study – 2013 are out and India has chosen its Most Trusted Brands. Nokia and Samsung, India’s two most trusted brands, retain the positions South India as well. South Zone’s 3rd Most Trusted brand is BMW, which has bettered it’s All India 4th rank moving up one slot. Godrej moves up two positions to be the 4th Most Trusted Brand in South and Sony loses two ranks from the national list to be the 5th Most Trusted Brand in South India. Airtel garners extra trust in the South and is the 6th Most Trusted brand in South India gaining three ranks from its All India position. Reliance loses two ranks in South and takes up 9th rank, while Ponds makes a surprising entry at 10th position gaining 13 slots from its All India rank. Studying India’s 500 Most Trusted Brands’ movement in the South Zone shows that South India has extremely different preferences as compared to rest-of-India. Out of India’s Most Trusted 500, 147 do not make it to the South list. The brands which have over-performed the most in the South as compared to their All India ranks throw up some surprises, and are Zee (up 105 ranks), Maxx (up 63 ranks), TVS (up 59 ranks) and IBM (up 58 ranks). On the other hand, the brands that take the worst trust beating in the South as compared to All India ranks are Dabur Real (down 746 ranks), VIP Bags (down 671 ranks), Chevrolet (down 497 ranks) and AOL (down 486 ranks). TCS rides its’ All India 91st rank on its Southern prowess, where speeds past to 17th rank (TCS ranked 561st in West, 300th in North and 29th in East). In the All India ranks, the category leaders are as follows. After being ranked second two years in a row, Coca-Cola makes it as India’s Most Trusted Aerated Soft Drinks brand, albeit with only a 2% lead over the 2nd ranked Pepsi. Nano rides in as India’s Most Trusted four-wheeler car brand and among Consumer Products, Tide beats Surf Excel while Nirma surges ahead of Hindustan Unilever as the latter slips significantly. HCC is India’s Most Trusted Infrastructure brand, DLF leads in Real Estate and, in education, IIT is more trusted than Oxford University and IIM. In F&B, Parle-G leads in biscuits and Cadbury’s DairyMilk is the Most Trusted Chocolate Bar among seven brands listed. World Health Organization leads in trust among Global Bodies followed by YMCA, UNICEF and Red Cross. Dabur, the Ayurveda leader, also leads the Healthcare Super Category of 36 brands. The mosquito repellent, AllOut, has been a leader three consecutive years and has noticeable lead of 120% over the next ranked, GoodKnight. The category of Internet has 25 brands this year and though Google leads Facebook this year also, it is only by a miniscule 3% margin. Surprisingly, though there are significant variations in South Zone ranks as compared to All India, though many of Category leaders remain unchanged. The upsets in South among Category leaders are – in Spykar is the Most Trusted Apparel Brand followed by Raymond (Lee and Levi’s are All India’s Most Trusted duo), Godrej is also South’s preference in the Diversified Category (compared to Tata which leads this category in All India), Ponds leads in Personalcare for South (beating Lux which is the All India Most Trusted), Woodlands is preferred in South as compared to Nike in Personal Accessories and Ratan Tata is the Most Trusted Personality in South India as against Anna Hazare who leads the All India list. Delhi, India. 30th January, 2013. The results of the most anticipated brand study, The Brand Trust Report, India Study – 2013 are out and India has chosen its Most Trusted Brands. Nokia and Samsung, India’s two most trusted brands, retain their positions in the North. North Zone’s 3rd Most Trusted brand is Godrej, which has bettered it’s All India 6th rank. BMW maintains the same position in the North as in rest of India by taking up the position of the 4th Most Trusted Brand and Reliance gains two ranks from the national list to be the 5th Most Trusted Brand in North India. Tata loses one place in North and is at 6th, while Sony loses four ranks to be 7th Most Trusted Brand. Apple is also more trusted in the North at 8th rank than in rest of India where it ranks 12th. Bajaj and Airtel lose one rank each to be the 9th and 10th Most Trusted Brands in North Zone respectively. Studying India’s 500 Most Trusted Brands’ movement in the North Zone is quite revealing. The brands which have over-performed the most in the North as compared to their All India ranks are VIP Bags (up 229 ranks), Reliance Foundation (up 196 ranks), Dhirubhai Ambani (up 182 ranks) and Windows (up 164 ranks). On the other hand, the brands that take the worst trust beating in the North as compared to All India ranks are Toyota Innova (down 1578 ranks), SetWet (down 825 ranks), Emirates (down 737 ranks), FILA (down 635 ranks) and Royal Stag (down 612 ranks). Six brands were not even mentioned in any of the interviews in the North, namely, Accenture, 7 UP, Head & Shoulders, Airwick, Amaron and, surprisingly, Baba Ramdev. The North and All India ranks show a large difference demonstrating that the North thinks quite differently from rest of India. Only 18 brands have north zone ranks that follow the national ranks within 10% rank variation, while 107 brands show a rank variance of over 90% when compared to national ranks. Anna Hazare is the Most Trusted Personality in India, at 87 th rank this year, but in North, he is the 32nd Most Trusted Brand. Being Human, Salman Khan’s Foundation, however, maintains its rank as the Most Trusted NGO in India. Most brands in the Technology Category have gained trust ranks this year with Apple being listed as the Most Trusted Technology brand. Indigo Airlines is this year’s Most Trusted Airline as Air India slips to second position. Surprisingly, though there is a lot of variations in ranks in North as compared to All India, though many of Category leaders remain unchanged. The upsets in North among Category leaders are – Navneet overtakes Cello Pens as Most Trusted Stationary brand, Blue Dart overtakes DTDC and DHL in Courier Services, Big Bazaar overtakes KFC in Retail, Olay overtakes Lux in the Personalcare Category and Facebook beats Google to lead the Internet category. In Healthcare, though Dabur leads both North and All India, Moov and Crocin displace Himalaya and Iodex for 2nd and 3rd ranks. The Food & Beverage Category also sees similar inclination and Amul leads in both geographic comparisons, though in North, Britannia ranks 2nd and Coca-Cola 3rd, taking over Maggi and Parle’s positions from the All India list. The BFSI category sees LIC in first rank in North as well as All India, but ICICI (as a diversified finance brand) move up to second place in North, displacing SBI in second position from the All India list. Mumbai, India. 29th January, 2013. The results of the most anticipated brand study, The Brand Trust Report, India Study – 2013, are out and India has chosen its Most Trusted Brands. Crowning the list, Nokia, Samsung and Sony are India’s three Most Trusted Brands this year. Nokia leads for the third consecutive year, while Samsung and Sony have both moved up two ranks from last year to occupy the 2nd and 3rd slots. BMW has made significant progress with a climb of twenty ranks to become India’s 4th Most Trusted Brand. Tata slips three positions as India’s 5th Most Trusted after being in second place in the previous two years. Godrej is India’s 6th Most Trusted Brand and has moved up five ranks from last year and Reliance ranks 7th having gained three positions over 2012. Bajaj slips to 8th rank moving one down from the previous year, Airtel maintains its position at 9th and LG is India’s 10th Most Trusted brand, losing seven ranks from last year. The Brand Trust Report, India Study, 2013 (BTR 2013) is the third in its series and this year the report lists India’s 1100 Most Trusted Brands from 211 categories. The report was launched in the city today and is a result of a comprehensive primary research based on 61 attributes called the Brand Trust Matrix. The research conducted among 2505 influencer-respondents from 16 cities, generated more than 3 million datapoints from 13000 hours of research. After being ranked 2nd in the Areated Soft Drinks Category for two years in a row, Coca-Cola takes the position of India’s Most Trusted Aerated Soft Drinks brand, albeit with only a 2% lead over the 2nd ranked Pepsi. Nano rides in as India’s Most Trusted four-wheeler car brand and among Consumer Products, Tide beats Surf Excel while Nirma surges ahead of Hindustan Unilever as the latter slips significantly. HCC is India’s Most Trusted Infrastructure brand, DLF leads in Real Estate and, in education, IIT is more trusted than Oxford University and IIM. In F&B, Parle-G is the Most Trusted biscuit brand and Cadbury’s DairyMilk ranks highest among Chocolate Bars in which seven brands are listed. World Health Organization leads in trust among Global Bodies followed by YMCA, UNICEF and Red Cross. Dabur, the Ayurveda leader, also leads the Healthcare Super Category of 36 brands. The mosquito repellent, AllOut, has been a leader three consecutive years and has noticeable lead of 120% over the next ranked, GoodKnight. The category of Internet has 25 brands this year and though Google leads Facebook this year also, it is only by a miniscule 3% margin. Anna Hazare is the Most Trusted Personality in India, and has risen in trust ranks from 106th last year 87 th this year leading a list of 35 personalities from Cinema, Spiritual, Sports, Social and Business. In the same list, Aamir Khan ranks 2nd (up from his fifth rank last year) and Salman Khan slips to 3rd, within a small 2% gap of each other. Being Human, Salman Khan’s Foundation, however, maintains its rank as the Most Trusted NGO in India. Most brands in the Technology Category have gained trust ranks this year with Apple being listed as the Most Trusted Technology brand. Indigo Airlines is this year’s Most Trusted Airline as Air India slips to second position.